Meet the man behind the art at the MAC. Exhibit designer Ryan Hardesty, left, and soil scientist Chandra Neils install a soil monolith for the exhibit Dig It! It takes five guys in a half-empty exhibit hall at the Museum of Arts and Culture to crack open and unpack the massive wooden crate. Inside is a miniature house encased in Plexiglas, an educational snow globe of sorts. The two-story house has an emerald lawn and a dug-up garden, but most importantly, it sits atop layers and layers and layers of soil, which are exposed in a kind of cutaway. The house will appear in a new exhibit at the MAC called “Dig It! The Secrets of Soil,” a Smithsonian Institution exhibition that explores the nature of soil and why it’s important to our existence. It’s mid-January, two weeks before the exhibit opens, and Ryan Hardesty, the MAC’s 38-year-old exhibit designer and preparer, has to figure out where it’s all going to go. Walls must be painted and rearranged. The crates must be delivered, unloaded, their components assembled and arranged so they make sense. Envisioning an empty room as a completed exhibit requires foresight, planning and a heavy dose of imagination. Hardesty, an artist in his own right, began his first exhibit installations while going to school in Boston. See more of Young Kwak's photos of the preparation of Dig It, the MAC's new exhibit on soil ecosystems. “Boston was one of those towns, probably like New York or Chicago, where you could actually piece together a little bit of a living by bouncing from installation to installation,” he says. That was his job for a few years, a “weird lifestyle” that saw him hopping between museums as a freelancer before landing his first full-time position as an assistant at the Institute of Contemporary Art in Boston. It was his roots in the Pacific Northwest — Hardesty was born in Spokane and grew up in the Seattle area — that brought him to the MAC, where he’s remained for the past 10 years, shepherding between nine and 12 full exhibits each year. This exhibit came from the Smithsonian Institution in three semi-trailers, according to MAC spokesperson Rebecca Bishop. By comparison, it took only two semis to deliver the Leonardo da Vinci show to the museum last summer. Behind the chaos of crates and the Plexiglas house is the one almost fully formed exhibit element: the monoliths. 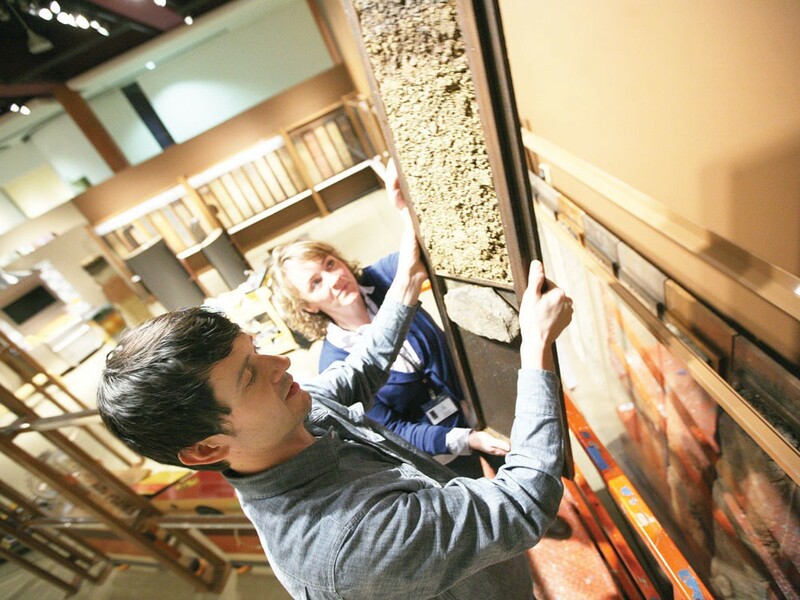 These are tall wooden display cases that show a vertical cutaway of each state’s soil layers. Each much be placed upright behind a sheet of glass. The challenge for Hardesty is to do all of this without disturbing the soil. “You want to be on your ball because they’re real fragile, real crumbly,” says Hardesty of the monoliths. Collected in the late 1990s, the monoliths come with their own supervisor: United States Department of Agriculture soil scientist Maxine Levin, who has flown in from Washington, D.C., to make sure they’re properly installed. At this point, the crew has dropped in most of the monoliths. On the exhibit floor, however, Washington, Vermont and Hawaii await their turn. Once all the exhibits fall into place, the volunteers will leave and Hardesty will walk the exhibit. There’s a slim window between when the bustle of volunteers leave the new exhibit and when the crush of patrons enter. Hardesty gets that piece all to himself.